Norma Cartwright has spent 44 years working for Oklahoma City Public Schools in the cafeteria. For 44 years now Norma Cartwright has showed up to work each and every school day to teach kids. She’s never given a test, a quiz or even homework. 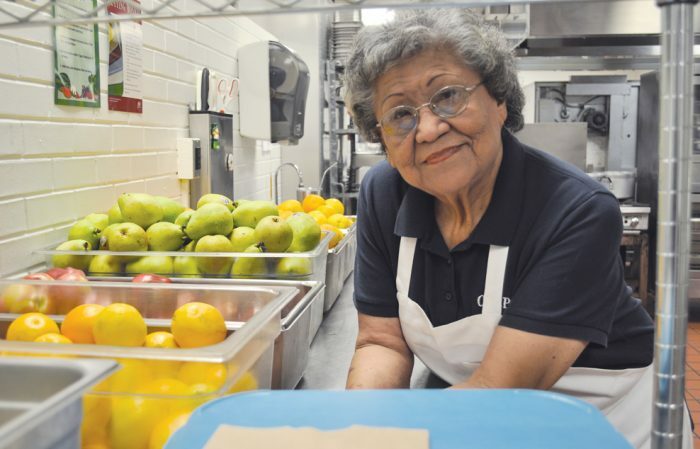 But tying on an apron at five in the morning, Cartwright gives every student what they need to succeed as Oklahoma City Public Schools’ longest-tenured cafeteria employee. In the early days she baked from scratch. Sandwich bread, hot dog and hamburger buns, cookies, cakes and cinnamon rolls all were made by Cartwight’s loving hands. Things got a little easier through the years as the district moved to more prepared items. But she’s always put the same amount of heart into whatever she’s doing. And as her career winds down she says it warms her heart to see the district offer free meals to every student in the district for the first time. Breakfast at Roosevelt means preparing some 500 meals. Lunch balloons to over 700. Carol Jones is Cartwright’s cafeteria supervisor. She’s amazed at the increasing numbers of meals coming out of the kitchen. From the first day of school, cafeteria managers reported an increase in the number of meals served. Gwen Thompson has been in the kitchen with Cartwright for 21 years. Cartwright raised three kids and sent all of them through Oklahoma City Public Schools. She stayed home until the youngest entered junior high. A school schedule meshed perfectly with a family schedule. Years later, she’s still in school even though her kids have kids of their own. Schools across the district report serving more meals. Teresa Gipson works at Shidler Elementary located on the corner of SE 15th and S Byers. She entered the district in 1982 at West Nichols Hills and moved into the kitchen 12 years ago. On more than a few occasions Gipson and her fellow co-workers have gone into their purses to get money to pay for student lunches. “Every kid should get to eat.” Gipson explained that once a student’s lunch account balance reached a certain number a note would be sent home to the parents. The child could receive only a few more lunch trays before they were unable to choose what they wanted to eat. From there, a sack lunch with a peanut butter jelly sandwich, a fruit and a milk would be their only option. Kevin Ponce has spent his entire career in child nutrition. Oklahoma City’s school nutrition services director says the district could break even if not see a return on its investment through the USDA’s reimbursement program. Cartwright has six grandchildren – all within the OKC metro. She says she plans on spending at least one more year with the district. She’s still got a lot of free meals to prepare. Take them out to lunch, or cook their favorite meal. Sharing favorite foods and treats can spark memories, creating opportunities for chats about treasured moments. 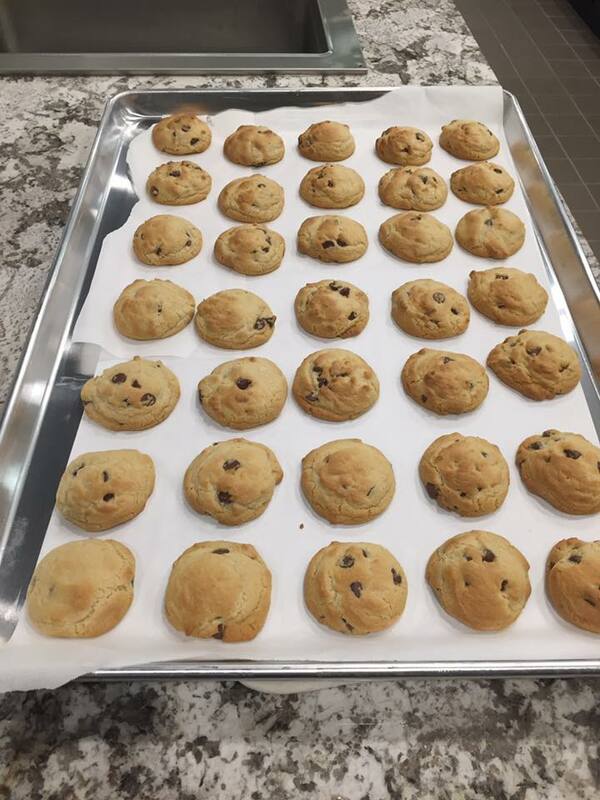 The residents at Iris Memory Care love when our home is filled with the smell of fresh cookies or warm bread. Make a scrapbook with them (or for them), and include letters, photos and other special mementos. This is a wonderful opportunity to research and learn more about your loved one, their friends and family, and their work, hobbies, and accomplishments. Philip’s favorite part of scrapbooking is preparing the pages for the pictures. Ask them to tell you a story (and be a patient listener!). One of the best ways to learn about our history is to listen to someone who has lived it. Having a loved one be genuinely interested in you feels so meaningful! 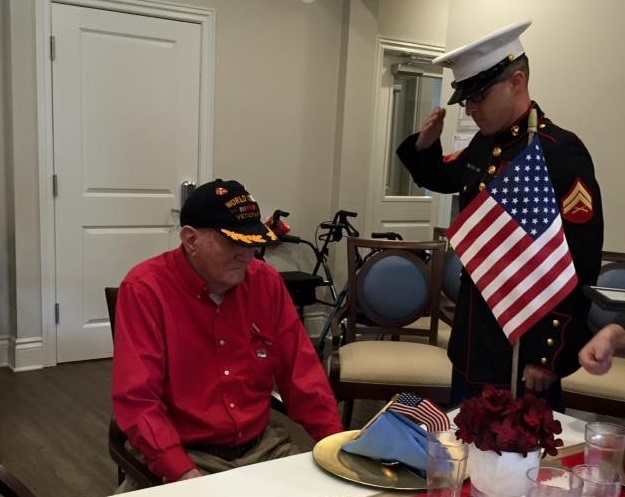 Thanking Harry for his decades of military service. He has some stories! Go on a field trip – visit places that are familiar and have fond memories (childhood home, ice cream shop, an outdoor park, or a favorite store). Familiar sights, sounds, and smells often trigger cherished memories and help even the quietest individual share! Take a family photo, frame it, and have family members sign the frame. Dusting off those old family memories sitting in a box or photo album shows your loved one that the moment in the photo has meaning to you. 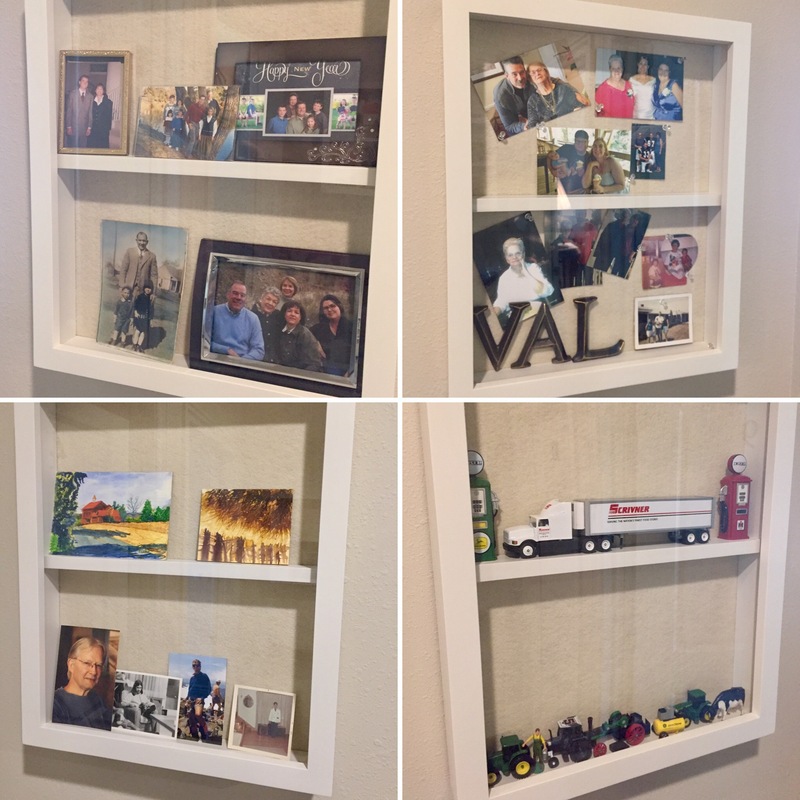 At Iris Memory Care, our families make sure their loved ones’ memory boxes by their door are filled with pictures and mementos with wonderful memories. Get crafty and make homemade decorations for their room. Putting forth time and effort on a loved one’s behalf to make their surroundings cheerier has the two-fold benefit of making them feel valued while also bringing a little life to their space! 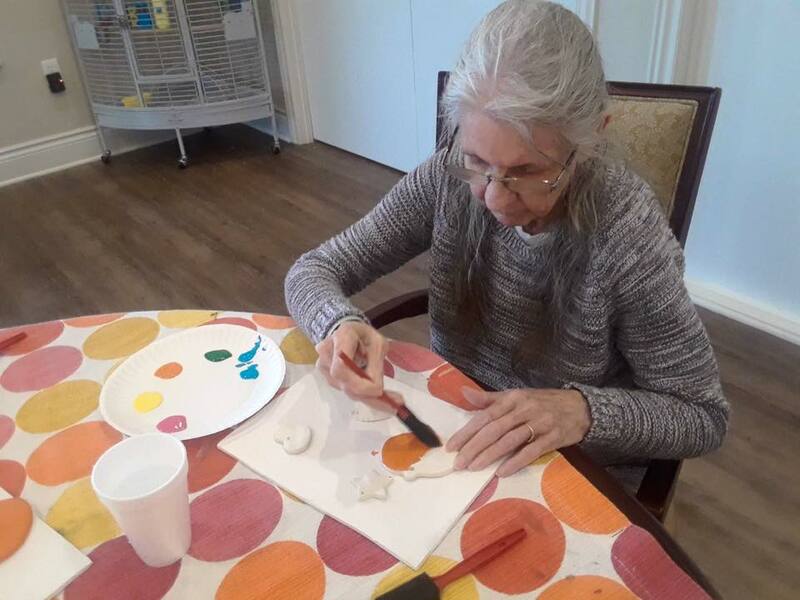 Diane painting clay ornaments to decorate her room for fall. Encourage them to participate in classes or activities at a local senior center or senior living community (and then join them). Staying active and engaged has been shown to increase longevity and quality of life. Let your loved one know about different activities in the community and offer to give them a ride or help arrange transportation. Show interest in what they are up to! Doris enjoying the sunshine while she draws. How can you tailor these ideas to meet your loved one’s specific health needs? 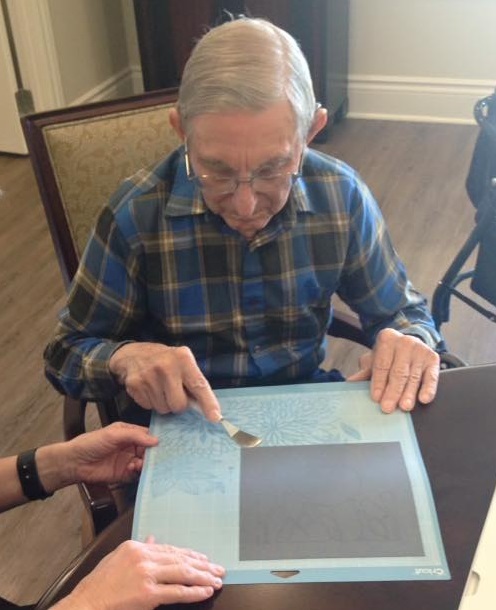 For an expert opinion, please contact a personalized consultant from Iris Memory Care at (405)-330-2222. 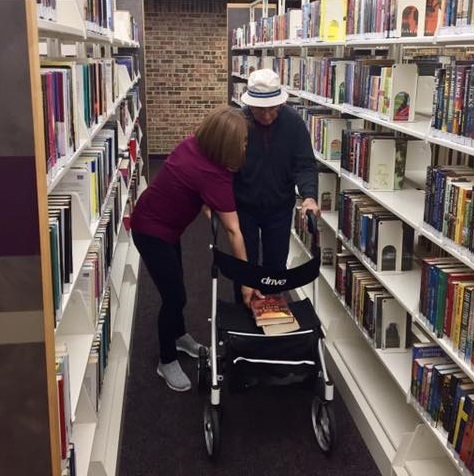 Philip, an avid reader, loved visiting the library with Sylvia. That’s a plus for anyone but particular someone in her line of work. Peterson is a licensed alcohol drug counselor with a mental health endorsement who has worked for AllianceHealth Midwest more than five years. “I just get craziness in my head,” Peterson laughed. “I want to practice what I preach to patients. I always tell them not to limit themselves. If you want to set your mind to do something do it. Every day things happen that I don’t believe. I never would have believed I could have run a half marathon. Mealfull owner Cynthia St. Peter has designed a service to provide affordable, quality meals to those in all stages of life. Given the option, few people would turn down a good, home-cooked meal. But sometimes circumstances just don’t make it possible. That’s why Cynthia St. Peter decided to create Mealfull to give everyone – even those who can’t afford it – the opportunity to have comfort food. 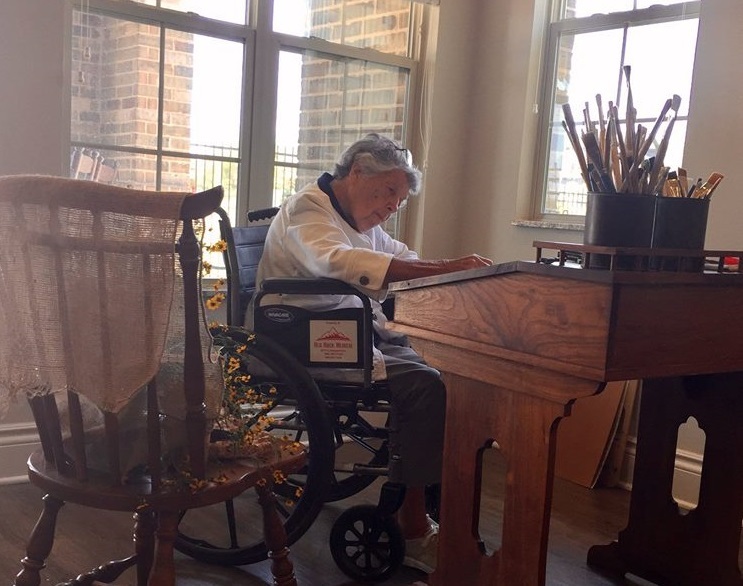 After retiring from a 40-year music ministry career, St. Peter found she still had a passion to create. “Food – it’s a win-win for everyone,” St. Peter said. “Feeding people is just a basic need. Whether they’re homeless and they can’t afford it we’re going to give it to them. If they’re shut-ins and can’t get out of the house we’ll get it to them. Mealfull operates out of Earth Elements Kitchen in the historic Farmer’s Market District in Oklahoma City. All food is locally-sourced, farm-to-table..
Breads are baked fresh at 4:30 a.m. by St. Peter’s chef, who then prepares that day’s offerings. “My heart is in three special places,” she said when asked what the business looks like. With 15 years as a single parent, St. Peter knows first-hand there is a need for quality food for busy people. “It would have been great if there was a food delivery service that actually cooked it, it was delicious and they brought it to you,” she laughed. Busy people get up early and work late. There’s really no desire to shop then come home to cook. All too often the drive-thru is the default first-choice for busy people. “We stop at a fast-food place and pack on 40 pounds,” said St. Peter, who admitted even when she worked as a chef she would go through the drive-thru at the end of the day. Today’s millennials encounter a job market like no other in history. St. Peter sees her own daughter’s embedded in the rat race, with little time to slow down between work and family. Mealfull can have hot selections waiting for them on their front porch or can go inside and stow them away in the fridge. Another facet of the business is providing meals to seniors in their homes. “They don’t feed themselves. They have the money but they make friends with the pizza guy so that’s what they order every night,” she said. “Wonderful, comfort food” is how St. Peter describes her menu, which rotates weekly. And it’s not just a drop-off solution. Another option Mealfull offers is going into a client’s home and cooking the meals on-site. That allows for hot food and good company – something many seniors are starved for. At the end of the day, MealFull coordinates with local social workers. St. Peter prides herself on a zero waste policy. “We deliver the food to the homeless at their under-the-bridge camp,” St. Peter. “We have so much waste in the food business. If we were a restaurant we would have to throw it away. But we’re not … so we can do whatever we want to do with our food at the end of the day. For the past 10 years, families have hired St. Peter to go into their loved one’s homes to cook for them. “Families would hire me because their parents wouldn’t eat,” she said. “They wouldn’t cook for themselves because they couldn’t. They wouldn’t eat because they would think they weren’t hungry – especially those with dementia. St. Peter quickly became a part of the family, going into the home and serving not only as a provider of sustenance but a source of peace of mind for the children who worried about how their mother or father was doing living alone. Mealfull is also offering the option of ordering an entire holiday dinner for as few as two to as many as 12. Feasts include slow-roasted turkey breast, sliced spiral ham and a cornucopia of sides and desserts. Delivery is offered at no extra charge. Orders are now being accepted through Nov. 17 or while supplies last. Got to mealfull.com for more information or call 405-568-6684. 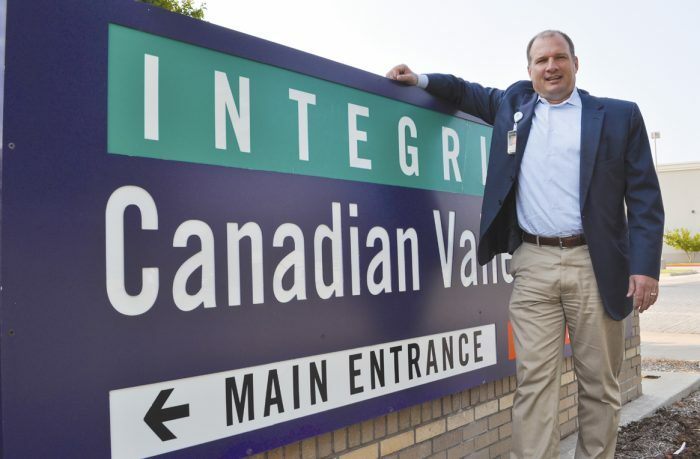 Integris Canadian Valley Hospital President Rex Van Meter, MHA, is hoping he can ensure emergency helicopters no longer have to land in the grass in Yukon. 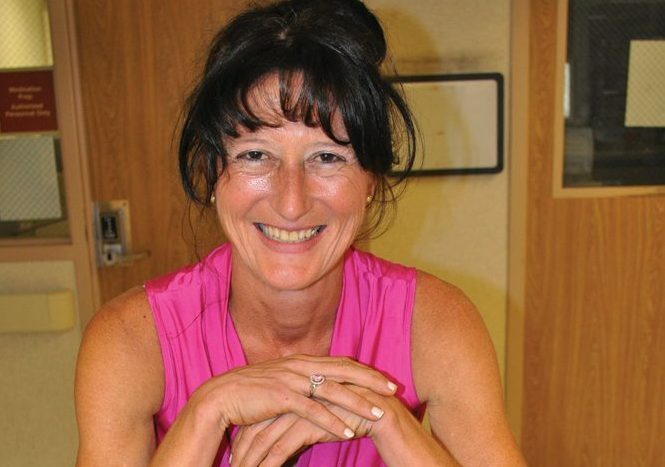 Valerie Austin, MBA, BSN, RN, CEN currently is the administrative director at Integris Canadian Valley Hospital. But not too long ago she was a flight nurse in Arizona, flying wherever she was needed at a moment’s notice. Austin understands all too well what it means to put on a flight suit and step into an air ambulance. Less than a year after she left the field in Arizona her chopper crashed. And while it was expected that landing at an accident site could be nerve-wracking it was always a comfort knowing the return trip landing would be at a place conducive for a quick transfer into the facility. It’s one of the reasons she’s so passionate about an ongoing project to bring Integris Canadian Valley its first helipad. Over the past year the number of transfers – by air and by land – to ICVH has grown several fold. And when a helicopter touches down it’s on a grassy patch near the ER. There’s a paved sidewalk that reaches halfway. In order to build a landing pad the hospital needs to raise funds. A major step in that direction will be this Friday’s Big Hats Big Hearts event at 10 W Main in Yukon. Van Meter said current bids for the pad are $240,000 and up. The 16-year-old hospital has experienced phenomenal growth with two major capital projects including a third floor. “We’re seeing volumes grow and we’re seeing patients from other communities being sent here for care,” Van Meter said. The Integris Transfer Center fields calls from hospitals around the state for placement within the Integris network. During the calendar year of 2014, ICVH received just 30 transfers from the center. This calendar year is already shaping up for more than 200. Most are by ground but air transfers are rising. Each time the hospital accepts an air ambulance the Yukon Fire Department is called out to set up a perimeter. That takes a rescue crew out of service. The hospital’s east parking lot has become an inclement weather landing site if the grass landing zone becomes saturated. Van Meter calls it a community project with a benefit that will ripple statewide. Austin’s flying days are behind her, but the memories of what could have happened will stay with her forever. She just wants flight nurses, paramedics, pilots and ultimately patients to have the best chance at success possible. And that means giving them a safe place to land. Anita Van der Laan pictured with Grietje, a sibling to her beloved Gemma. Growing up in the Holland province Fryslan, Anita Van der Laan never imagined she would one day have an 8,000 head dairy in Oklahoma. Van der Laan’s love for dairy began at a very young age on her family’s 90-head Holstein dairy back in Holland. She is a 5th generation dairy farmer, with farmers on both sides of her family. 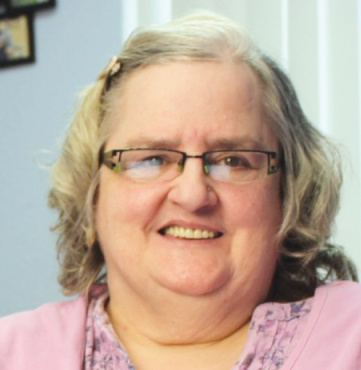 A defining moment in Van der Laan’s life occurred when she was graduating high school. Because she was a woman, the family dairy went to her brother, and her father told her it was time for her to find somewhere else to work. Van der Laan made the decision to move to the United States and start dairying here. Her life took another twist when she attended a Thanksgiving dinner in Texas with neighboring dairy farmers. A young man named Pieter Van der Laan had a birthday on Black Friday, so the friends decided to decorate his house for his birthday while he was out milking. Little did Van der Laan know, Pieter grew up about 30 miles down the road from her in Holland, also on a dairy farm, though the two had never met before coming to Texas. After the two were married on January 26, 1990, they combined their small herds, got a loan from the bank and started their dairy with 40 cows. Both kept their other jobs to pay off the loans so they could buy more cows. Their herd slowly and steadily began to grow. Today, they have grown to 8,000 head of dairy cattle. They have two dairies in Frederick, Okla., Van der Laan Dairy, milking 2,900 cows and Sunshine Dairy LLC, milking 1,500 cows. Van der Laan is proud to say they are 100 percent owned by her and Pieter. Sunshine Dairy LLC sells their milk to Lonestar Milk Producers, and Van der Laan Dairy sells their milk to Select, which sells milk to Hiland Dairy, a popular brand seen in grocery stores across Oklahoma and surrounding states. But no success story is without its trials. Sometimes many. One morning when Van der Laan was out feeding calves, one particular Brown Swiss calf named Gemma butted during feeding, causing the bottle to painfully bump Van der Laan in the chest. A very tender lump appeared within days, and after several weeks of no improvement, she finally went to see a doctor. Her fears were confirmed when the doctor diagnosed her with breast cancer. Van der Laan says if it had not been for Gemma, the cancer would not have been found. “I had never even held a bottle that way,” Van der Laan said, “It was just meant to be. Though Gemma sadly passed away during Van der Laan’s chemotherapy treatments, Gemma’s bloodline lives on at the dairy. She has three siblings on the farm—Gloria, which means glory to God, Gertrud, which means glory to God in Dutch, and Grietje, which means pearl of God in Dutch. Van der Laan will forever hold a special place for Gemma in her heart. “She saved my life,” Van der Laan said. “In all the dairy farming, you would never imagine God would send you an angel like that—but He did.” Difficult times did not stop with Van der Laan’s fight with Breast Cancer. 2011 proved to be a very challenging year, bringing severe weather such as extreme heat, drought, and tornadoes. In June 2011, their dairy was hit by a small tornado. The contractor had just completed the remodeling and repair work in October when an EF-4 tornado devastated their dairy on November 7, 2011. They lost over half of their baby calves, 450, and many more cattle were injured. A farm they frequently did business with came with a large trailer and took the remaining healthy cattle back to their farm to allow the Van der Laans to rebuild and recover. 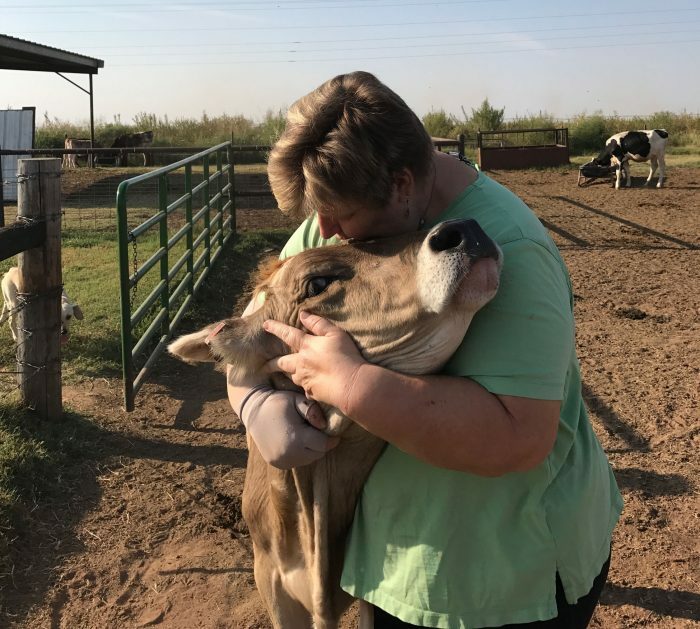 Van der Laan says despite the hard times, Oklahoma has been good to them, and she can’t imagine dairying anywhere else, especially because of the way their neighbors came to their aide in the time of need. “Oklahoma is home to us now,” Van der Laan said. Today dairies across the country are selling out and going out of business, so one can’t help but wonder what makes the Van der Laans continue to dairy. It is certainly not an easy life. Dairying is 24 hours a day, 7 days a week, and 365 days a year— it never stops. But Van der Laan simply laughs and says she understands it is not for everyone. The Van der Laans have three children, Eric, Wilma and Liza, who have all come back to work and help with the family dairy. Most recently, Wilma and her new husband have joined the family’s operation. Wilma’s husband is an engineer and now heavily involved in their 6,000 acre crop farming, and Wilma continues to help out with the dairy. Van der Laan says working with their three children is very special, and describes it as a beautiful life. As seniors we have grown up and through the space race with its many accomplishments, many made by Oklahoma Astronauts. Once such celebrated Oklahoma astronaut is Lt. General Thomas P. Stafford. 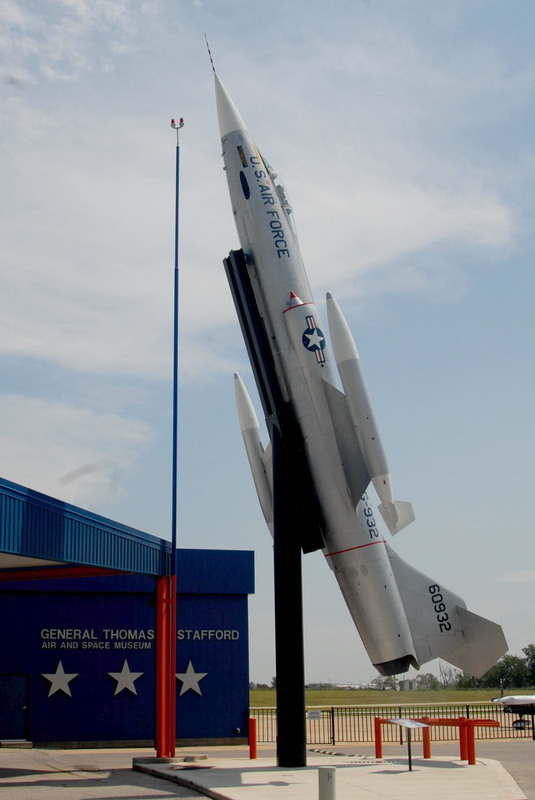 The Stafford Air Space Museum is a destination not to be missed if in or near Weatherford, Oklahoma. It is next to Interstate 40, at 3000 Logan Road. You are greeted even before entering the museum with the Pathway of Honor exhibit. Here you can buy a customized brick around the foundation of the Apollo boilerplate exhibit in front of the museum. A 4 x 8 inch brick with two lines of text is $70, or the larger 12 x 12 inch brick with the option of a Company Logo with text, for $225.00. Your named brick will be in the company of astronaut legends of Neil Armstrong, Gene Cernan, and Jim Lovell among others. For further information and to contact the Pathway of Honor and museum call 580-772-5871. The museum was named a Smithsonian Affiliate in 2011 as it houses over an acre of exhibits representing the evolution of aviation and space flight. They have worked closely with the Smithsonian Institution, NASA and the U.S. Air Force Museum assembling one of the best collection of aerospace artifacts in the central United States. 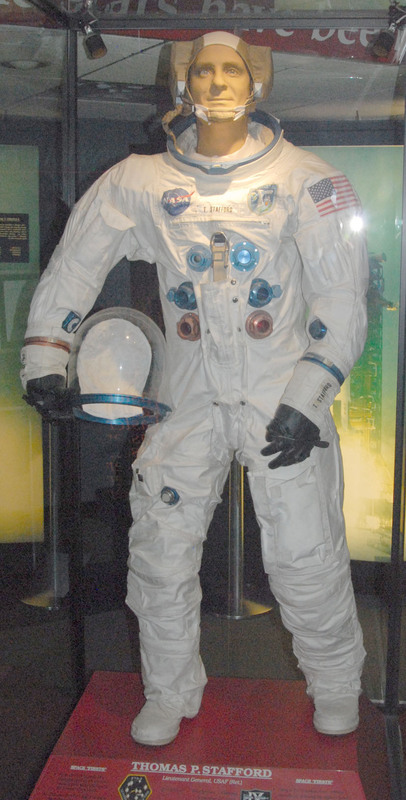 While there are some artifacts that are samples or replicas, many are the actual item used in space. 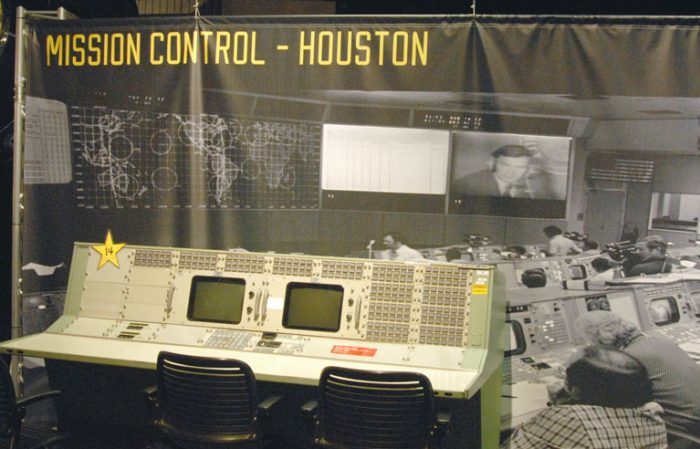 This includes Stafford’s 1969 flown Apollo 10 pressure suit, space shuttle main engine, the mission control console, a disarmed Mark 6 nuclear warhead and an F-86 “Sabre” Fighter. Besides American artifacts are Soviet examples like the Soviet Mig-21 “fishbed” fighter, one of the most produced jet fighter aircraft in history as the front-line fighter during the Cold War. There is also the actual V-2 Rocket Engine, as the only remaining actual V-2 rocket engine left in existence which was developed by Nazi Germany during World War II. Replicas are also on display including: the Bell X-1 rocket plane that punched through the sound barrier in 1947, Hubble space telescope in 1/15 scale, and the full scale replica of the Gemini Spacecraft flown by Stafford in the Gemini 6 and 9 missions. Stafford was born in 1930 and raised in Weatherford, graduating from Weatherford High then on to the U.S. Naval Academy in 1951. In 1962 he was selected in the second group of NASA astronauts and would go on to fly four space missions. In 1979 after retiring from the Air Force, he has flown nearly 130 types of aircraft and helicopters and logged near 508 hours in space. Today Stafford maintains a home in Oklahoma City and one in Florida near the Kennedy Space Center. When in Weatherford a lunch or dinner at Benchwarmer Brown’s Sports Grill, at 108 East Main, is a delicious choice. A sports type bar/restaurant with video screens, offers several menu items, including a juicy Chicken strip entre. Other offering are fresh burgers, hand breaded onion rings, other sandwiches, and brick oven pizza. At just over a year old, Benchwarmer fills a dining option welcomed in Weatherford. If your road trip is not rushed an overnight at the clean and comfortable Days Inn might be your economic destination. Complete with a warm do it your self-breakfast area, pool and plenty of parking, it fills the needs of the average traveler. It is an easy off and on from the Interstate and less than a mile to downtown, at 1019 East Main. 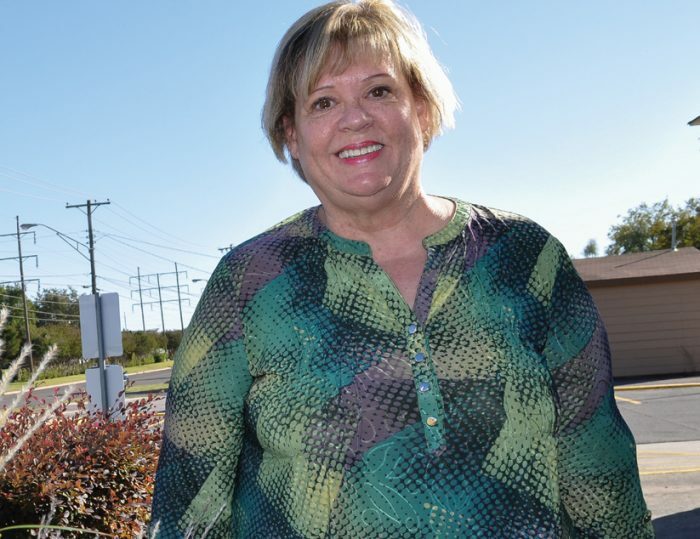 Louise Bryant of Ada is being recognized as a Significant Woman in Oklahoma Agriculture. The Bryants’ existing family tree is loaded with pecans. Louise, 76, husband Carrel, 79, son Randy, 56, and daughter Lisa, 45, make up Bryant Pecan Company of Ada. Louise was raised on a Jersey dairy about four miles south of Ada. She witnessed, from early on in life, a family operation. Their dairy delivered door to door, and occasionally, in the case of her brother Albert, beyond. “Sometimes, Albert would go into houses and put the milk into the refrigerator for them,” she said. Louise met Carrel through 4-H Club, but they didn’t start dating until her first year at East Central University in Ada. In college, they came across each other one night while dragging Main Street. They had a lot in common and shared many of the same values. Carrel and Louise married in 1960 on his parent’s wedding anniversary, April 13. When they married, Louise and her husband moved to Carrel’s dad’s place and that’s where they continue to live. He and his dad farmed together as long as his dad was able to farm. “After we got married, my dad gave us a Jersey heifer which we kept until she got sick,” she said. The Bryants now own about 690 acres with almost 2 miles of river bottom on the South Canadian River. In the early years of their marriage, cattle and hay were their primary products but they still picked up native pecans. Today, son Randy oversees much of the daily operation, which focuses on pecans and a herd of purebred Horned Hereford and primarily Angus commercial cattle from which they raise black baldies. Daughter Lisa handles the marketing and promotional products of the family business. Louise said they probably have upwards of 4,000 trees now. In addition to the native pecans, the majority of their trees are improved varieties. The more you shake this family’s tree, the more you learn just how much each member is involved, such as Louise. Through the years on the farm, Louise has raked hay, brush hogged, fed and worked cattle and grafted, harvested and cleaned pecans. 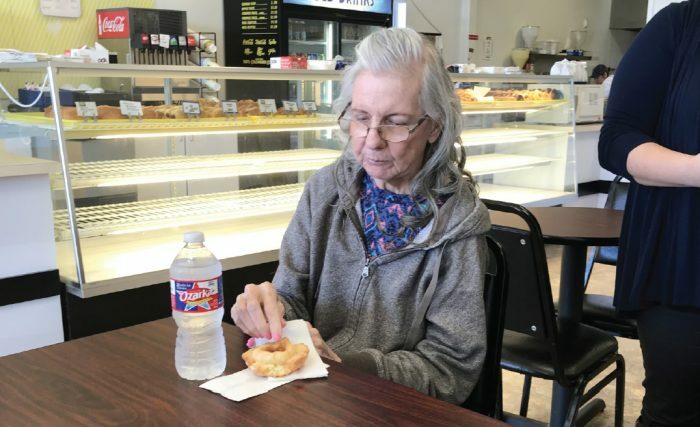 “We also have a retail store where we market many of our pecans as well as candy, pecan oil, Amish products and gift items,” she said. These days, that retail store occupies most of her time. She manages the daily operations of doing the paperwork, ordering supplies, shipping orders and running the retail space. There have never been lulls in Louise Bryant’s life. Besides helping on the farm, she taught at Byng Schools for 21 years. She has also taught a Sunday school class, been a 4-H leader and was president of Pontotoc County Home Demonstration Council. Bryant was secretary/treasurer of the Pontotoc County Fair Board for 11 years. She served nine years on the Farm Service Agency board. “I followed Carrel on the board, and Randy replaced me,” she said. Bryant also has served on the Pontotoc County Farm Bureau women’s committee and as a director for the Oklahoma Hereford Women. That’s the way Bryant’s recipe for “Mama’s Best Pecan Pie” – the 2014 Oklahoma Pecan Food Show Grand Champion Pie – starts off. Bryant is not only a pecan producer. She’s a fan from tree to pie pan. Recently while out among the pecan trees, Bryant looked up at some of the weighted branches, bowing with pecans that will soon be harvested. As she did, the October sunshine in Pontotoc County seemed to just reflect off her face, highlighting her smile. 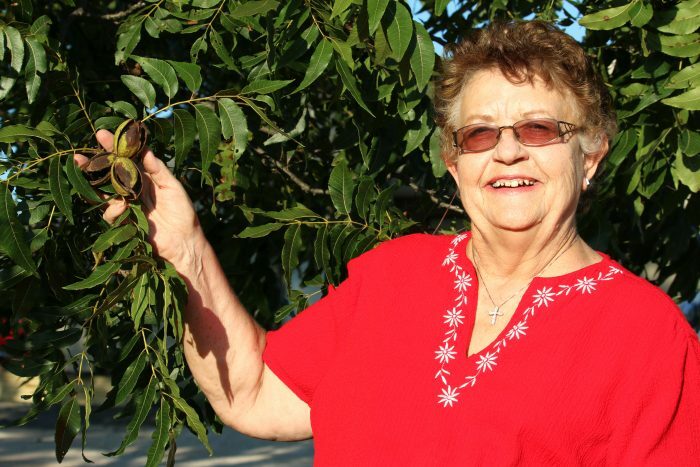 In addition to the phrase about waiting to count your “pecans until you have them in the sack,” Louise, when facing the challenges of daily life, often reflects on what her grandmother Canzada Newton, often repeated. 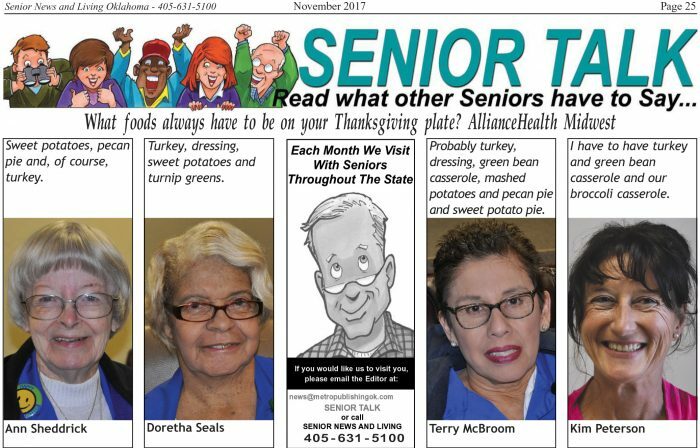 SENIOR TALK: What foods always have to be on your Thanksgiving plate? How do I rest in God in a situation where drama occurs daily? I lived for many years with a daughter who suffered from borderline personality disorder (BPD). BPD is characterized by pervasive instability-moods, relationships, self-image. As her mother, I felt like she was a black hole that sucked me dry and spit my bones back out. I struggled for twenty-four hour periods I could call good. Hours were easier to come by. Some days I settled for minutes. If I waited for a perfect day, I was doomed to disappointment. So I relished whatever time God’s love broke through the clouds. That experience came to mind when I asked a cousin how she had survived the death of her mother and the breakup of her marriage, a month apart. Resting in God didn’t mean the absence of difficulties. Both Jan and I tried to tell God how to fix the problem. Perhaps you do the same. What changed was we knew where to take our problems. Only God knew every detail of every day. We talked to Him about we wanted, because only He could bring about that miracle. In the process, we learned something else: we trusted God because He never deserted us. Intellectually, few of us have a problem with that statement, but experience gives the knowledge weight. I sat in the balcony of my church, mouthing the words of praise songs, unable to sing because I was crying. Before and since, I tune to Christian music when in need of a praise fix. In that holy, wordless place, God held when I fell apart. His constant, loving presence carried me through the years following my divorce, my son’s teenage troubles, my daughter’s lifelong troubles, the double whammy of my mother and daughter’s deaths, and more recently, my failing health. My cousin learned a similar lesson when her teenage son nearly died in a traffic accident. After three days of the continuous bad reports, she told the Lord that He could have Macon. She not only thanked God, she also “drew a ‘line in the sand.’ Did I truly trust God?” Giving her child to Jesus was the hardest thing she had ever done. She returned to the ICU late that same night, expecting nothing. A nurse looked at me and tilted her head as if she was puzzled. “He seems to be turning a corner.” Macon clung to life. Later she learned at that very hour a circle of nurses was holding hands and praying for him. Friends and family continued to visit, all bringing a message of hope. Macon lived. Powerful. Impossible. I can’t do that, we might say. That will never happen for me. I could never pray like that. A lot of her peace grew because during her divorce, she had already learned that resting in God sometimes meant toughing it out, sometimes five minutes at a time. Life in a nursing home involves a lot of waiting, and I hate it. Lately God’s given me tons to write. I have plenty of time … if I felt better. If I didn’t need an aide to move my meal tray so I can set up me computer. Of course, help comes eventually, but I still have to wait. Perhaps it’s time to make use of my old kitchen timer. When I’m counting the grains of sand in the hour glass, it runs in a continuous supply in heaven. God gets me through the day, five minutes at a time.